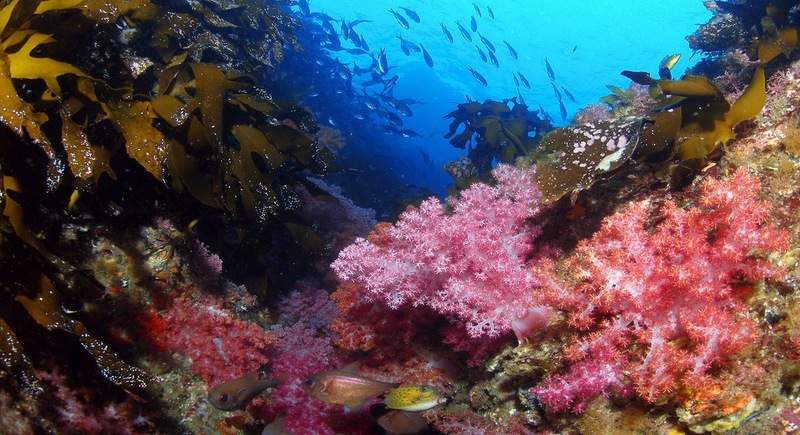 Sacred and Spectacular Soft Corals of Gangjeong by Katherine Muzik, Ph.D.
We must defend the sacred and spectacularly beautiful Soft Corals of Gangjeong! My unbearably sad experiences witnessing coral reef devastation around the world, and especially the irreversible destruction of the Okinawan reefs which I studied for over three decades, motivates me to rise in defense of these beautiful Jeju corals. We must defend them. They are spectacularly beautiful, and alive! Corals have no voice of their own, but all too frequently, scientific specialists, intimidated by the government institutions in their respective countries, cannot speak out. As a specialist in Octocorallia (soft corals), it is my duty, and my honor, to help the local villagers defend their environment and their way of life, and their beautiful octocorals to which I am so devoted. I have been studying Octocorallia all around the world, in both the Atlantic (Florida, Puerto Rico, Belize, Mexico, Jamaica, Bermuda) and the Pacific (the Philippines, Australia, Fiji, New Caledonia,Thailand, Chuuk, Hawaii, Japan and Okinawa) for 42 years. I can state unequivocally, based on my personal observations and a review of pertinent scientific literature, that Jeju’s octocoral assemblages are unique, spectacular, and worthy of special protection. They form the largest and most spectacular temperate Octocoral forests known on Earth. Particularly convincing are Dr. Jun-Im Song’s prolific and exhaustive reports on their taxonomy, reproduction and distribution, replete with numerous photographs and detailed topographical maps. My recent communications to discuss the flourishing Guangjeong octocorals with scientists and underwater photographers, working in Australia, the Red Sea, Taiwan, Micronesia, Japan and Indonesia, all serve to confirm my words. So peculiar and surprisingly beautiful are Jeju’s Octocoral forests that they were designated as Korean Natural Monument #442 and a UNESCO Biosphere Reserve. They feature high coral coverage on a substrate of ancient Andesite lava, and depend on the warm and rich Tsushima Current, a branch of the Kuroshio, to form diverse habitats from 5 to 60m deep. Unlike tropical coral reefs, Jeju’s temperate octocoral assemblages are unusual in being dominated by species without zooxanthellae (symbiotic algae) in their tissues. Lacking these algae to provide them nutrients, they must capture food with their typical, eight (hence, “octo”-corals) feathery tentacles around the mouths of each flower-like polyp animal forming a coral colony. They are sessile suspension-feeders, meaning that each coral is fixed in one position for its lifetime, and its polyps capture food (plankton and dissolved organic matter) as it passes by in the ocean currents. Their presence is quintessential as habitat for other marine life, including other invertebrates and fishes, very much like trees in a forest provide home for other creatures. However, because they are permanently attached, octocorals are unfortunately unable to escape the threats of man’s activities. They are defenseless. Construction and operation of the proposed 125-acre commercial port and military facility would bring them certain disaster, and in fact, already has. Recently, typhoon Bolaven wrecked seven 8,800 ton caissons made of cement, and sent them along with thousands of huge cement tetrapods, crashing down into the sea, causing havoc and destruction which can only worsen with continued construction activities. 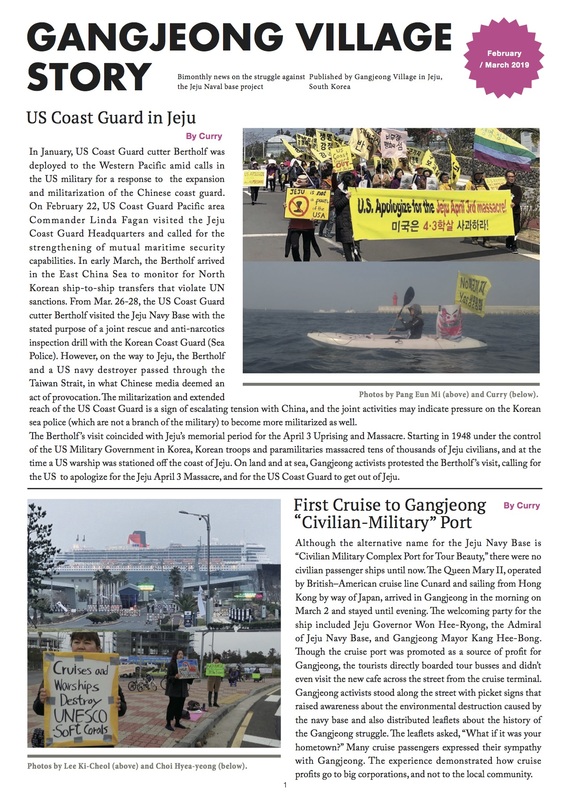 Apart from the devastating typhoon, the Base at Jeju had already brought Okinawa-style destructive shoreline development. Nearly all the shoreline around the main island of Okinawa, where I lived for eleven years, is lined with cement. Huge cement tetrapods and storm walls, huge tracts of reclaimed land blanketed in cement, and massive cement port facilities characterize the Okinawan seaside. Will Jeju’s pretty southern coastline soon resemble Okinawa’s? Construction of the proposed port activities would continue to load the waters with lethal sediments during the planned 4-year construction phase. We must stop construction! It is destruction! These toxic sediments will be kept re-suspended by continuous ship-traffic after construction, not to mention by the storms and typhoons, which are increasing in power and frequency. And, the completed port will surely alter the currents which bring the corals their crucial plankton diet, and which are essential for distribution of their planktonic larvae. Shoreline cement construction projects not only alter water currents and destroy corals, they also destroy terrestrial habitats. For example, the insatiable need for rock to make cement has led to decimation of mountains in northern Okinawa. Also, kilning of rock used for cement with coal has contributed to intolerable increases in atmospheric pollution and mercury pollution in our seas and our seafood, worldwide. The proposed Jeju Base construction will require massive amounts of cement. From where will the cement rock, and the coal for the Jeju port be obtained? What other habitats will be ruined? How much more air and water pollution will surely result? I first fell in love with the purple octocoral “sea fans”, over 60 years ago, as a child playing in the pristine blue waters of Puerto Rico. I was fascinated, watching them dance and sway in the ocean currents. To see the demise, worldwide, of these beautiful marine creatures, in just my lifetime, by pollution, global warming, acidification, and now, military-industrial greed, is heartbreaking. Given the accelerated pace of deterioration of coral reefs everywhere, how can we allow one of the most beautiful octocoral forests in the world, which provides natural, cultural and economic resources to a community and a country, to be destroyed forever?